Olivier Award-winning magician and illusionist Derren Brown returns to the West End with his latest captivating show Derren Brown: Underground. After a sold-out run at London’s Charing Cross Theatre, the unrivalled entertainer takes his new show on an extensive UK tour, stopping off at the Playhouse Theatre for a strictly limited run. 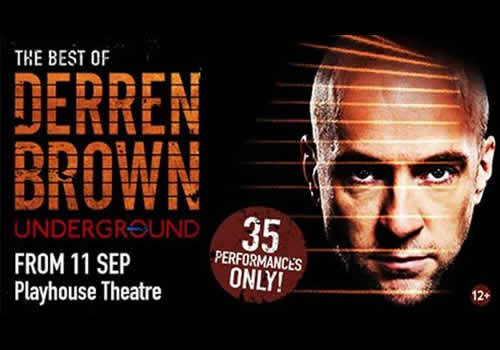 Pulling together highlights from his previous smash-hit productions, Derren Brown: Underground reimagines old tricks and favourite moments to create one night of spectacular entertainment. Using magic and mind-control of epic proportions, the show is a spellbinding experience that combines Brown’s expert showmanship with incredible magical genius. After completing a sold-out US tour with his show Secret, Underground marks Brown’s eighth stage venture, with previous West End productions including Miracle at the Palace Theatre, Svengali at the Novello Theatre, Enigma at the Adelphi Theatre and Something Wicked This Way Comes, which earned him the 2006 Olivier Award for Best Entertainment Show. Since then, Derren Brown has become synonymous with his television specials that have sought to explain how you can manipulate the human mind. His 2016 documentary Pushed to the Edge was met with controversy when it saw Brown push a stranger into almost committing a serious crime. Derren Brown: Underground is directed by Andrew O’Connor and Andy Nyman, and promises a night of unforgettable entertainment, featuring some of Derren Brown’s best and most notable tricks. Playing a strictly limited 35 performances at the Playhouse Theatre, the show runs from September 11th to October 14th 2017. Derren Brown: Underground is recommended for those aged 12 and up.